Rainbow’s End, Suite 201, of the Gym Club Suites is a 1300 square foot, two story apartment suite with a 560 square foot deck that has a 270 degree view of Old Bisbee. When the building was being renovated in 1985 into a 17 unit apartment building, the managing partner of the project, Garth Collier of Collier-Craft Development Company, designed this unit to be his future residence. Mr. Collier lived in suite 201 and Mr Craft lived in suite 105 after the project was completed. View from SE corner of suite 201 deck. View from SW corner of suite 201 deck. After twenty some years, the wood deck has deteriorated. It’ time for a new one. But, it’s a big job. The deck has no outside access and it’s two stories above ground level. 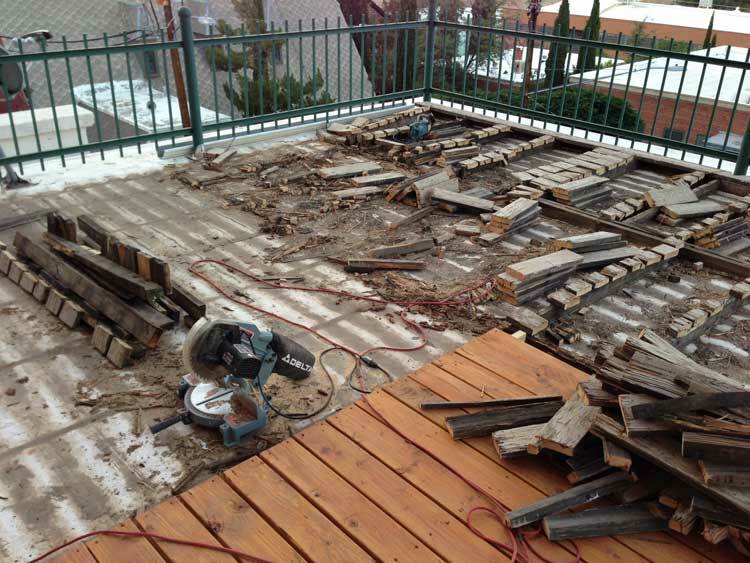 The old wood from the existing deck will need to be removed and disposed of. The roof where the deck sits on needs to be cleaned and be coated with a couple of layers of roof coating because we’re hoping we will not have to work on it for another 20 years. New wood will have to be taken up – over 150 pieces of 8 footers. It’s mid-May. The weather was getting hot. But, it needed to be done before the monsoon season began. We started out with an 8’x8′ area just outside the patio door. We took out the existing 8×8 deck – pried the wood boards off the joists, banged in the exposed screws, cut down the boards for easy handling. We experimented with different gap sizes between the boards and how to compensate for boards that were not straight. After the 8×8 area was finished, we had to stop for a while because of a check-in. This break gave us time to reconsider how we would approach the rest of the deck. On the left are old joists with parts of deck boards still attached. On the right are stacks of 16″ 2×6’s. Lower right shows the 8×8 “new” deck. The new approach would be to eliminate any kind of prying and banging down the screws. This was accomplished by cutting both sides of the board that was screwed into the joist. We ended up with pieces of 2×6’s that were about 16 inches long and old joists with pieces of wood still screwed into them. The joists were then cut into smaller pieces with a miter saw. Once the old wood was removed, the roof swept clean and painted, it’s time to build. But, we had to take another break because of reservations. With the experience of building the 8×8 deck, we decided to build the deck differently from before – which was 6 or 7 smaller, independent decks put next to each other. This time, the deck boards would be staggered. 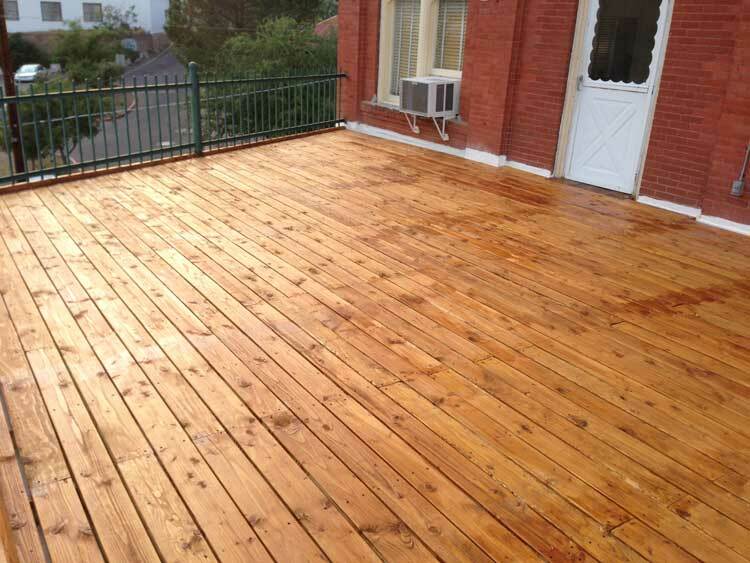 It was going to be one big deck – no more unevenness or wobbling. 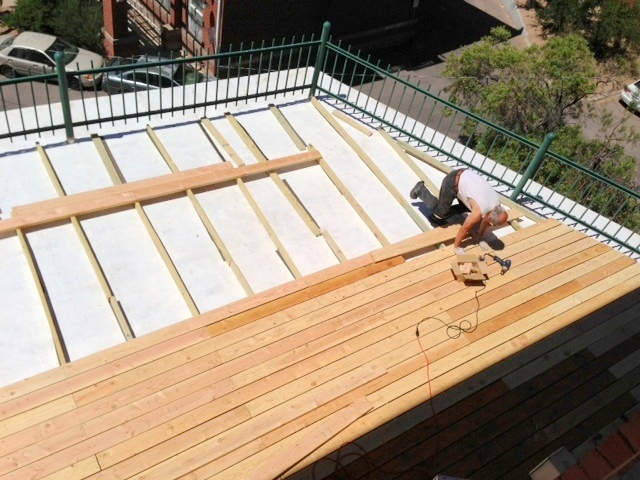 Building the deck – one board at a time. Now, imagine yourself enjoying a cup of coffee in the early morning – the sun is about to rise above the B Mountain. It had rained the night before, but there’s not a cloud in the sky. The air is crisp and fresh. You can hear the birds chirping joyously, welcoming a brand new day. Monsoon season is actually a great time to visit Bisbee. Our temperature is 10-20 degrees lower than that of Tucson or Phoenix. The average summertime low is in the mid 60’s. No matter how hot it gets during the day, we always have cool nights and mornings. As a bonus, you’ll get to see the gorgeous waterfalls of Bisbee after the monsoon rain. This year, we are offering low, low summer rates. So, bring your entire family and enjoy a delightful summer vacation in Bisbee, Arizona at the Gym Club Suites. We are also offering a summer deal at ArizonaGuide.com and DestinationBisbee.com. Summer deal and summer rates ends September 30th, 2013. Come visit us soon. About us: Originally built in 1903 as the YMCA, it is a registered historical landmark. Renovated in the 1980′s into a 17-unit apartment building; now it is a popular vacation rental for long and short term stays. Ever held a humming bird and felt the beat of a itty-bitty heart 250 times a minute? First watch this: A story about trapping and banding a hummingbird. The trapping method at the San Pedro may be different, but for each bird that is caught, the same information is measured and recorded. 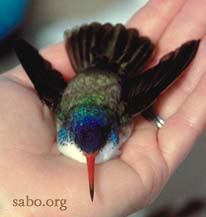 The Southeastern Arizona Bird Observatory (SABO) website has a whole page dedicated to Hummingbird Banding on the San Pedro River. 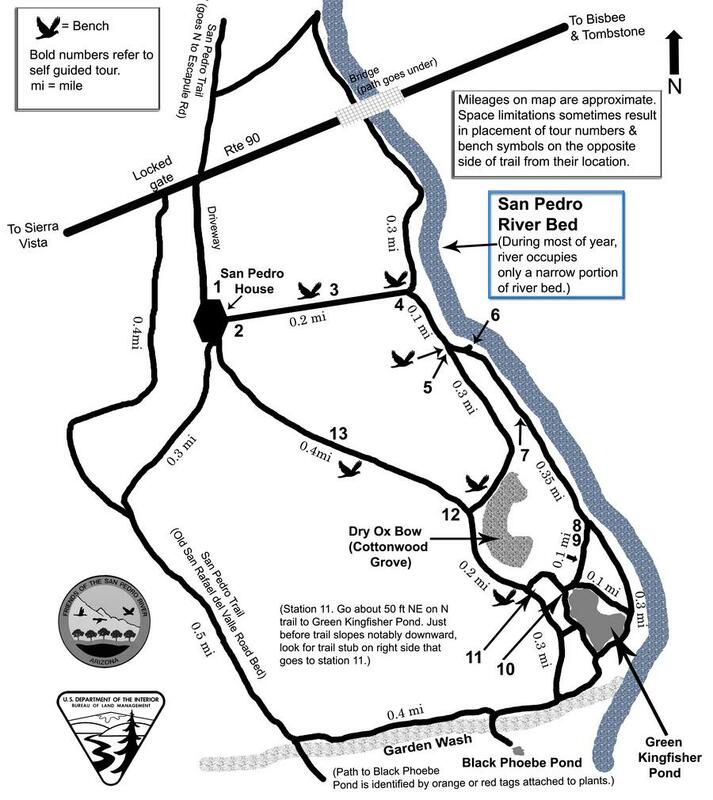 Hummingbird banding at the San Pedro River is open to the public. The 2013 summer schedule is as follows: June 29, July 6, 13, 19, 25, August 2, 10, 16,24, 30, September 4,14, 21, 28, October 5 from 4pm to 6pm. Call the San Pedro House at (520) 508-4445 for more information and to confirm schedule. Don’t you now want to hold one of those precious little hummers and feel its heartbeat? Plan on going to the San Pedro House on one of those dates above and come visit Bisbee. San Pedro House (SPH) is only a 20-minute drive from Old Bisbee. The address is 9800 Hwy 90 at the River, Sierra Vista, AZ 85650. SPH opens daily 9:30am to 4:30pm. Closed Thanksgiving Day and Christmas. Visit their website for other events (bird walk, education forum, spring festival) that may interest you. San Pedro River also offers numerous photo opportunities. Enjoy some of the beautiful photos take by Bisbee photographer Charlene Mitchell at the River HERE.